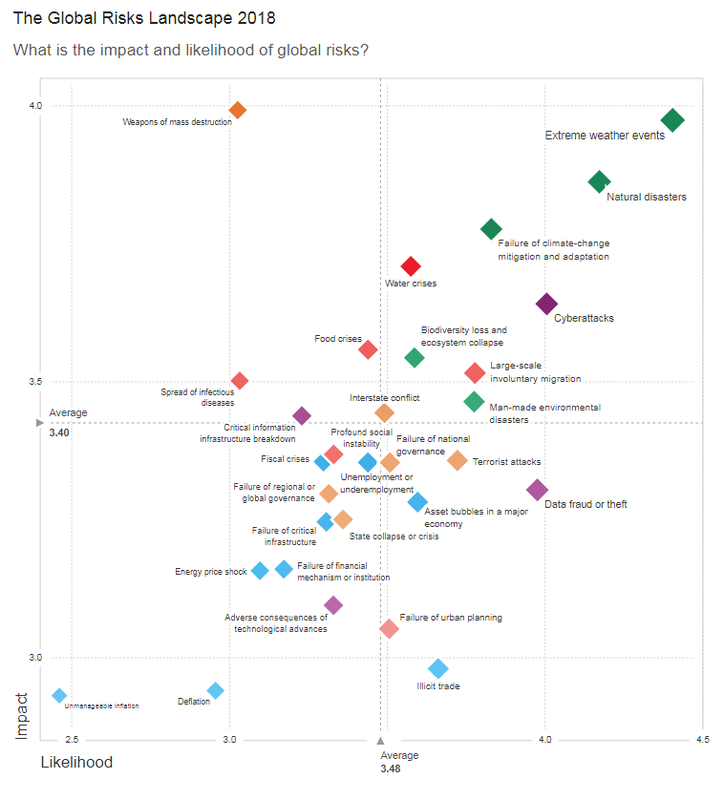 The latest World Economic Forum report on Global Risks 2018 has been made public, revealing that cyber-attacks are a top three risk to society, alongside natural disaster and extreme weather. The prospect of strong economic growth in 2018 presents leaders with a golden opportunity to address signs of severe weakness in many of the complex systems that underpin our world, such as societies, economies, international relations and the environment. That is the message of The Global Risks Report 2018, published by the World Economic Forum today. The annual Global Risks Perception Survey (GRPS) suggests that experts are preparing for another year of heightened risk. When we asked nearly 1,000 respondents for their views about the trajectory of risks in 2018, 59% of their answers pointed to an intensification of risks, compared with 7% pointing to declining risks. Alison Martin, Group Chief Risk Officer, Zurich Insurance Group commented: "Extreme weather events were ranked again as a top global risk by likelihood and impact. Environmental risks, together with a growing vulnerability to other risks, are now seriously threatening the foundation of most of our commons. Unfortunately we currently observe a “too-little-too-late” response by governments and organisations to key trends such as climate change. It’s not yet too late to shape a more resilient tomorrow, but we need to act with a stronger sense of urgency in order to avoid potential system collapse." James Longworth, Head of Solution Architecture at Insight UK, responded to the news: “The new WEF’s Global Risks Report 2018 confirmed once again that the threat of cyber-attacks is the modern times’ sword of Damocles – always on the back of everyone’s minds. The numerous attacks from last year proved that the nature of cyber threats is constantly evolving and no organisation, be it big or small, can afford to be complacent. “With the added context of the cost of suffering cyber-attacks set to rise, it was surprising to see in our recent survey of UK business leaders that only 38% said improving cyber security is a priority for their IT investment.